The last few days have flown past! The best thing about holidays is having time to just sit and knit. I discovered audio books some years ago. Here in the north we have long winters and lots of snow and we spend a lot of time ploughing. Audio books make that job enjoyable! You can completely forget that you are actually ploughing while listening to a book. All last winter I ploughed with Jack Vance’s Cadwal Chronicles. Fantastic! Little while ago I realised that audio books would work equally well with knitting. Even though knitting is enjoyable even in total silence, audio books are a nice distraction (as are films and tv series). 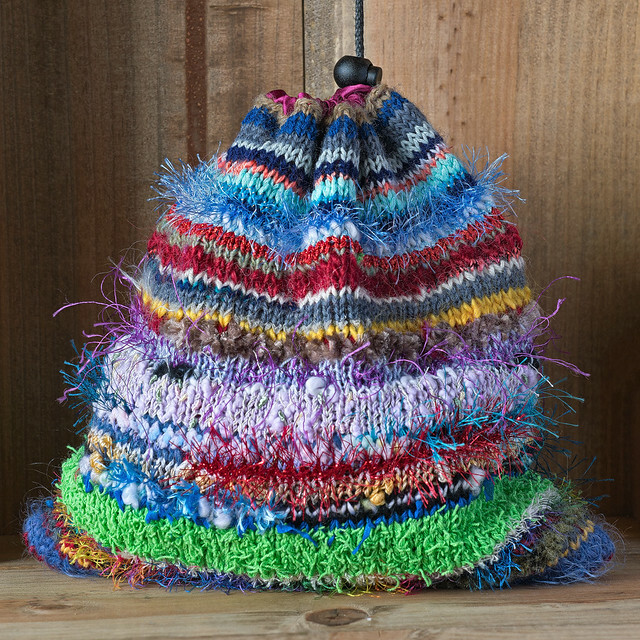 Past couple of weeks I’ve been knitting to Sylvain Neuvel’s The Themes Files. 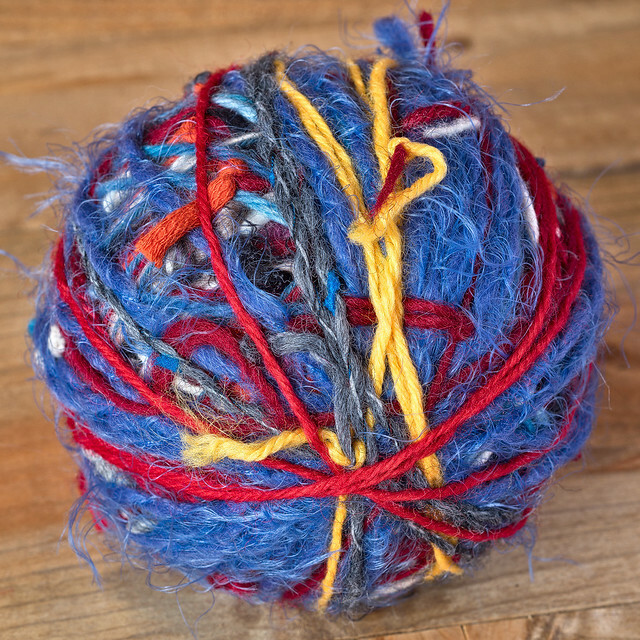 I hate wasting anything and one of the things I do with knitting and yarn is to collect short bits of yarn in a box and once I have collected some, I knot them all randomly and wind them into a ball. I use anything longer than about 30cm/12″. Bags are a good thing to use the surprise yarn ball for because all the knots are hidden underneath the lining. For the project bag I used mostly specialty yarn. Some 15 years ago there was a bit of a thing with card making using specialty yarn, and because my mum loved specialty yarn and had lots of it, I asked her some for my card making. She gave me loads but I never made more than maybe one card. I decided to knot mostly these specialty yarns but also some ordinary yarn. The result is a project bag so hideous that it’s almost cute! I added a satin lining and a drawstring. It’s big enough to take a sock or mitten knitting for a car ride with you.